at the head of the LIDAR pack. When working traffic in the real world, the equipment needs to be easy to set up, with large easy-to-read displays, and no-nonsense durability. That's what you'll find with the new Stalker Lidar RLR. 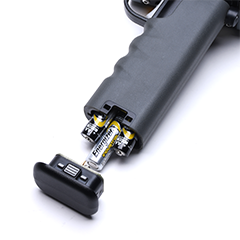 The new pistol grip Li-Ion battery snaps instantly into place, and provides power for at least two shifts. Plus, these sturdy batteries will withstand more than 500 charging cycles. With an average target acquisition time of 1/3 of a second or less, and a hand-held range in excess of 3,600 feet (over 9,000 feet on a tripod), it is hard to imagine a more effective speed enforcement tool. 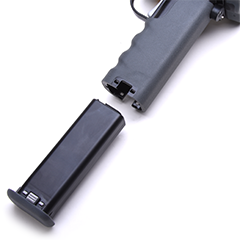 The "pistol grip" Li-Ion battery snaps instantly into place, and provides power for at least two shifts. Plus, these sturdy batteries will withstand more than 500 charging cycles. 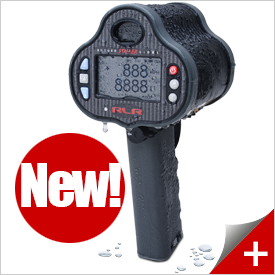 The Stalker RLR LIDAR’s new full character LCD display and simple menuing system make it the most user friendly laser on the market. Stalker LIDAR RLR’s C-Thru Technology enables the LIDAR to track targets despite the presence of trees, leaves, bushes, utility poles, and other obstructions between it and the target. The Stalker RLR units have, as standard, a Inclement Weather/Obstruction Mode which allows the unit to work in rain, snow, blowing dust, fog, as well as through fences, tree branches, etc. This also increases the operating distance when using the X-Series LIDARs through the front windshield of the patrol car. The RLR now have software that not only detects but ignores jamming pulses and continues to provide accurate speed tracking. The RLR can connect with peripherals such as printers or speed display signs. It allows the RLR to connect to a PC for serial data transfers or use with the Data Logging feature. Easily set up. Taking readings of two vehicles inside a 3-second window calculates the time a following vehicle will take to reach the current position of the car in front.